If a water park adventure is on your to do list, look no further than Big Splash Adventure located in historic French Lick, Indiana. This Southern Indiana destination is one of our best loved places in the country. While the Road Trip Teacher crew lived in southern Indiana for many years, we still visit often from our fulltime RVing travels. The French Lick – West Baden area is a favorite because there are so many family friendly things to do. We visited this area recently on another favorite Indiana stop at Spring Mill State Park. The campground is beautiful and the restaurant there is just like going to Grandma’s for Sunday dinner. After a fun Haunted Village weekend, we left our rig at the campground and headed to French Lick for some water park action. We splurged on a Pirate’s Hideway room with bunk beds for all four kiddos at the water wonderland. Staying at the Big Splash hotel makes visiting the water park a cinch. Family members have the flexibility to go back and forth between the water adventures and other attractions. Consequently, littles can take naps back at the room while older kids enjoy the water park (all housed in the same facility.) Guests staying at the hotel receive water park admission as part of the reservation package. Water park guests who are staying off property may purchase water park admission separately. Cost for the Big Splash day pass is between $19.95 and $24.95 per day depending on the age. Children under two (2) are admitted free to Big Splash Adventure with a paid parent or guardian. One of the most unique features of Big Splash Adventure is the retractable roof on the building. If the temperatures are just right, guests enjoy the safety of an indoor water park and the sunshine of a beautiful outdoor day. This facility boasts 40,000 square feet of water park activities. My roadschoolers love water slides but are also fans of all the water action. That’s what makes Big Splash a best liked destination on our water park list. Four aqua slides satisfy my older crowd while everyone enjoys the antics at the Buccaneer Bay splash pad. If a break from the action is needed, a trip down the Lost River is the most relaxing way to explore the water park. This Indiana water park is rated all thumbs up from the Roadschool 101 crew. It is also featured on this article: 19 Epic Indoor Water Parks You Will Want To Visit This Year! We have stopped here for just a day and we have also spent an entire week here for all kinds of family fun. Indoor carting, laser tag, family bowling lanes, and the Wilstem Ranch are other things we enjoy in this area of the Hoosier State. If you aren’t familiar with the history here, visit French Lick West Baden online and learn more! It all started as a joke when one of the Roadschool 101 crew said “Why can’t we just play games all day?” The immediate reaction was that roadschool isn’t all fun and games. Or is it? What happened after that is 30 days of roadschool games. You heard it, the Road Trip Teacher and crew made an intentional pact to play a game together every single day. For a whole month! As a fulltime Rving family, the Road Trip Teacher crew is always looking for fun but engaging games that are space friendly in our home on wheels. Every year about this time, we are on the edge of our seat for the Fulltime Families Toy of the Year reveal. The 2016 pick is the award-winning ThinkFun game Gravity Maze. What we especially love about this game is that it is designed to be a single player game. For this crew, that means if you’re done with your roadschool schedule for the day, you don’t have to wait for someone else to play. On the other hand, it’s also super fun to play with someone else. Because we are just a little lot competitive in this house, we are actually thinking of buying a second game to hold head-to-head challenges. Our roadschoolers have already asked and yes, the Road Trip Teacher has confirmed! Gravity Maze meets the criteria for the science portion of a typical roadschool day in our rig. That’s a win-win for everyone! For more details on how this game made it to the top of the Fulltime Families list, click here and you’ll also find out how to win yourself the 2016 Toy of the Year. 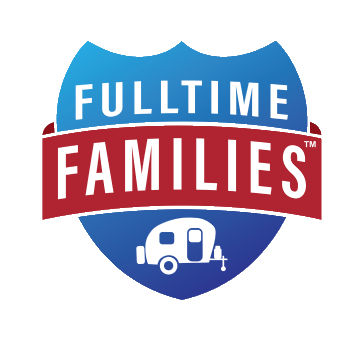 If you’re a traveling family and aren’t familiar with this camping club, visit FulltimeFamilies.com to find out why this is the most important membership in our collection! Last year there were upwards of 400,000,000 online searches in the United States for “love”. That’s more than the U.S. population! It’s a reminder that so many people turn to the internet to answer their deepest questions. And it’s a sign of the enormous need that so many people are craving love – to love and be loved. Unfortunately, it’s also a great example that many, many people are looking for love in all the wrong places. Feed your family well. Now, this is figuratively as well as physically in our house. First, it’s important to feed your family well in the form of input into their minds and souls. After all, what comes in, must go out. Positive, loving thoughts and information that is fed into our family members on a daily basis will come out the same, in one form or another. In a physical sense, just small doses of extra effort here and there in the healthy eating habits of your family will also realize positive results. Today’s Valentine’s Day: If you were already making sandwiches for lunch, cutting them in a heart shape will take you from zero to hero in about 5 seconds flat! Give your family the space it needs to grow. While it is so easy to try to control the outcome of every situation with a well-intentioned Mama’s heart, there really is something to be said for giving your kids and even your spouse, the room to grow and spread their wings based on their own thoughts and dreams. Providing them the love and support they need is just like Mother Nature providing the water and fertilizer needed to harvest good crops. Love is essential and space is required to grow and to flourish. Make your family a priority individually as well as a family unit. This means that while we spend much of our time as a family, during our roadschool and in our daily routines. But there is also a time to intentionally spend one on one time with each member of your family. Just as Mom and Dad needs one on one time to see each other in a different light, so does each and every other member of the family. Dad needs time with sons and daughters. Mom time with each kiddos is equally important. Honestly, we have even started extended this family date time, if you will, amongst the siblings in our household. Nurturing a big brother’s relationship with a little sister reaps rewards as sweet as a Mother/Son breakfast date. There is no substitute for time and attention. We’ve talked about one on one time and that is important. But loving your family well means making your time a priority by intentionally dividing your time for what’s real and what’s important. If you find yourself scrolling Facebook instead of reading to your littles, take the social media app off your phone. There are many facets to a Roadschool Mom’s day. Eliminate the parts of the day that really aren’t important to your family. Your days will be simpler. Your load will be lighter. And your family will be loved. At the end of the day, tuck your family in with the security of your unconditional love. No matter what has happened during the day, it is important for each and every family member to go to sleep with the confidence and well-being that they are safe and they are loved. Tucking your family in at night will have different meaning in your household based on your family ages, routines, and traditions. But, ending each day with the knowledge that you are loved, wholly and completely, is a true gift to your family. To listen to the Roadschool Moms’s 5 Easy Steps to Love Your Family Well, tune in to the February 14th episode of Roadschool Moms over at iTunes!